A side view of the compote printed with a different scene from the series reveals the molded handles and base. 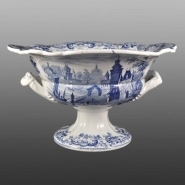 A large earthenware compote very well printed with views from the Pomerania series. This is one of many scenes in John Ridgway's series. Another view is seen on the side view below. Most pieces in this series were marked with the name, but the example shown here was not.